Even if you have a very small pond, there are still plenty of hardy pond fish species suitable for stocking. If your outdoor pond is between 50 and 500 gallons, you may be thinking that there’s less variety to the fish that you can have, particularly when taking into consideration the natural difficulties that come along with pond fish being outside in the elements. However, there are still many fish that you can keep in your small pond – you just have to think a bit outside of the box! While you won’t be able to have koi and other popular larger fish species in your pond, the perk of this is that you’ll be able to have more species of smaller fish that might otherwise get eaten in a larger pond. In addition, small fish still provide many of the same benefits as larger fish – many of them eat insects and/or insect larvae, some may consume algae, they of course provide aesthetic and charming appeal, and help to promote a unique backyard ecosystem that aids a variety of wildlife, from bees to frogs! 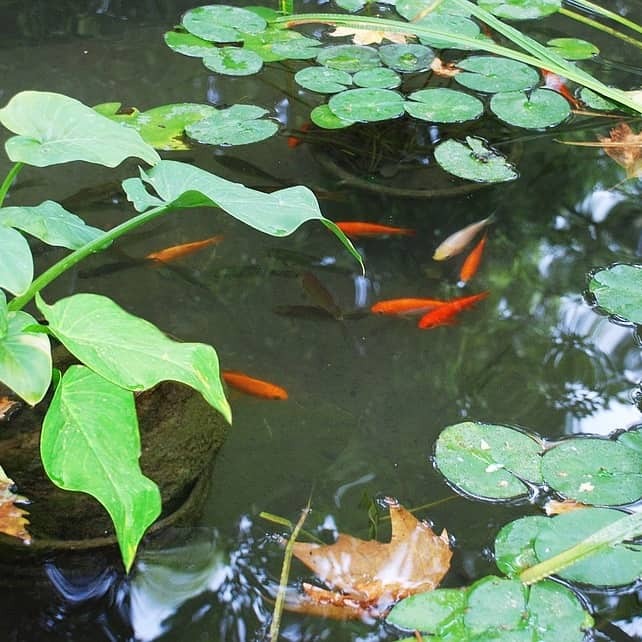 And, so long as you don’t overstock your pond, small fish will of course produce less waste for your pond (though you’ll still certainly need to clean and maintain it regularly). Note: While the fish listed here are considered hardy, they certainly cannot survive being frozen solid and this is more of a concern in smaller ponds that freeze more easily and quickly than larger ponds. If you live in a colder climate (one that regularly drops below freezing), you may still need to bring these fish indoors for the winter. Though goldfish prefer temperatures that are between 68 and 72° F (20 to 22° C), they are able to overwinter so long as temperatures don’t drop below approximately 50° F (10° C). Once water temperatures hit that mark, goldfish enter a state of dormancy called torpor in which they conserve their energy and are thus able to overwinter outdoors so long as the pond doesn’t freeze entirely. A pH of 7.2 to 7.6 is the most suitable for them, though they can tolerate fluctuations in this better than most other domesticated fish. Common goldfish need to have about 20 gallons of water per goldfish, while fancy goldfish may require more or less depending on their size or other factors; for example, pearlfish need closer to 30 or more gallons per fish due to the unexpected amount of waste that they generate relative to their smaller body size. Goldfish are social fish and prefer to live in small to medium sized groups, so you’ll need to have more than just one or two in order to keep them happy and healthy. Common goldfish are overall laid back and very non-aggressive, but temperament can vary a bit more with fancy goldfish depending on the variety. Common goldfish tend to enjoy swimming about and are fairly active fish, so it may be best to not stock them with fish that are overly sensitive or easily stressed. Most fancy goldfish are slow and have a hard time competing with more zealous fish for food, so you shouldn’t keep common and fancy goldfish together. The average goldfish lifespan is around 10 to 25 years with proper care, though the oldest one on record lived to be 43! Common Minnows. Photo by Etrusko25, available under a Creative Commons ShareAlike 3.0 license. The most commonly kept minnow species among ponders and aquarists is the fathead minnow, and so the term “common minnow” generally refers to them. Fatheads are an adaptable species that does well in cooler waters ranging from 53 to 68° F (12 to 20° C), often feeding on plant matter that is provided to them or that grows in your pond as well as adult and larval aquatic insects (including mosquitoes!) and algae. They’re native to much of North as well as Central America, though they do prefer cooler waters. They enjoy both swimming and lounging about, so your pond should have open space as well as hiding places like plants and hollow rocks or logs. Very sturdy creatures, fatheads are able to withstand conditions that would cause most other fish to perish or become ill, such as low oxygen levels, high turbidity, or pH variances outside of their 7 to 7.5 range. Regardless, you should do your best to keep water moving only slowly, the temperature and pH within their preferred range, and oxygen levels at or above 7 parts per million (ppm). In addition, in the wild they keep together in schools of 5 or more, so apply this when keeping them as pets. Each fathead needs at least 10 gallons of water. A Mosquito Fish. Photo by Fredlyfish4, available under a Attribution-Share Alike 4.0 International license..
As their name implies, mosquito fish (which are actually a variety of small minnow) are quite adept at consuming mosquito larvae, with just one mosquito fish eating anywhere from 100 to 500 of them in a single day! Each approximately 2 inch long adult needs at least 10 gallons of water, and the water should be between 50 and 84 °F (10-29 °C) with a pH ranging from 6 to 8. 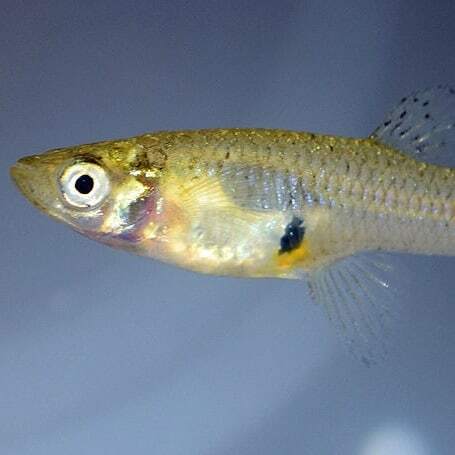 Since mosquitoes compose such a large portion of their diet in the wild, this means that mosquito fish can tolerate waters that have lower oxygen levels (do try not to let it fall below 5 ppm, though!) since mosquitos tend to lay their eggs in stagnant water. Much of their diet consists of insects and supplemented with a bit of plant matter and algae, so if you choose to feed them additional food aside from the natural insects that exist in the pond, stick to high protein snacks like brine shrimp or mealworms. While mostly peaceful, mosquito fish have been known to be aggressive at times and nip the fins of slower fish or those with long fins. With this in mind, don’t keep them with long-finned species or with docile and easily bullied fancy goldfish. Due to their extreme hardiness, they make excellent fish for even first-time ponders. Keep in mind, however, that they breed very quickly and as such you’ll likely need to get rid of some after a while. In addition, they usually live 1 to 3 years (with this short lifespan contributing to their quick reproduction). Photo by OpenCage. Available under a Creative Commons’s Attribution-ShareAlike 2.5 license. Sticklebacks, as covered in our article on unusual pond fish species, are small (less than 6 inches long) fish with a handful of bony armor plates that are more closely related to seahorses and pipefish than anything else. They’re bold and energetic, known to dart about ponds, but they aren’t known to pick on other fish with the exception of breeding season, during which males can become aggressive. The majority of their diet consists of aquatic macroinvertebrates like insects and crustaceans, but they’ll also eat tadpoles and the occasional bit of plant matter as well. 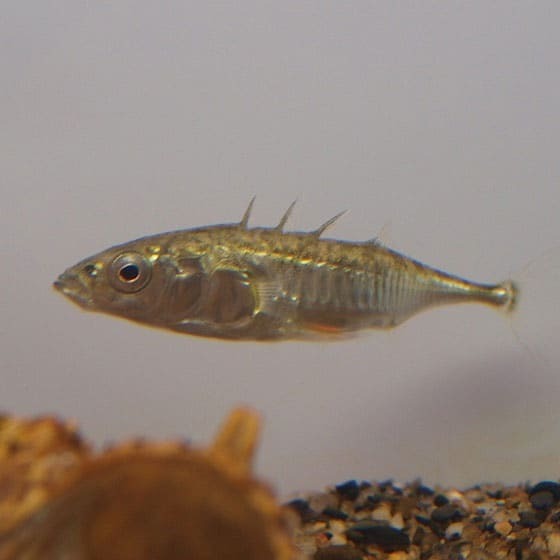 Perhaps the hardiest species on this list in terms of temperature, sticklebacks do just fine in waters as low as 39° F (3.8° C), though their general range of comfort is anywhere from 50 to 70° F (10 to 21° C); above 70° F and their metabolisms speed up to the point of illness. They prefer to be kept in groups of 5 or more, and again about 10 to 20 gallons of water per fish is suitable. Photo by Zach Alley available under a Creative Commons’s Attribution 2.0 Generic (CC BY 2.0) license. 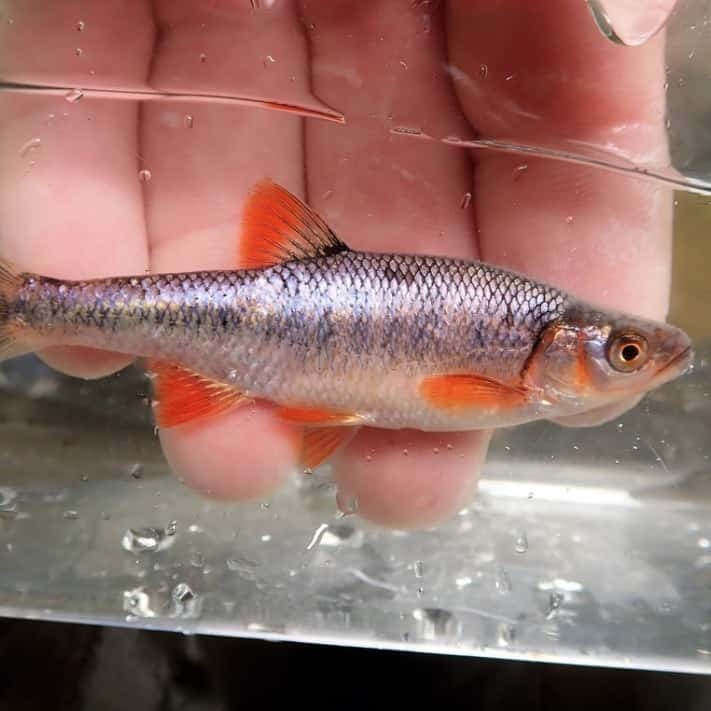 Native to North America, red shiners have silvery-blue bodies with vibrant red-orange fins and typically live around 3 years with proper care. In the wild, they’re often found in mountainous regions and as such are able to survive water temperatures as low as -21° C, though this is in extreme cases and water should be kept within the range of 59 and 77° F (15-25° C). They’re an active fish and can be known to nip fins, so don’t keep them with slow-moving fancy goldfish. Though tolerant of pH shifts from 5 to 10, water pH should be kept between 7 and 8 for red shiners, which are only about 2 to 3 inches long and need 20 to 30 gallons of water per individual. As with most small fish species, red shiners should be kept in groups of 5 or more so that they feel safe and comfortable. Though both of these are varieties of goldfish, they are listed separately due to their popularity, hardiness, and uniqueness. Shubunkins and comets look quite similar at first glance, but shubunkins often have blueish coloring and longer, more flowy fins. Both are very peaceful (but lively and playful), can grow up to a foot in length (though about 5 to 6 inches is more common), and live up to 15 years if properly taken care of. Each individual will need about 20 gallons of water in order to live comfortably, though closer to 30 works better since they are such active fish. Their temperature and pH parameters are the same as those listed in the goldfish section above. Comets in particular may nibble on plants (like water lettuce, hornwort, and anacharis), and also have a propensity to dig at substrate, perhaps out of nesting instinct, and as such may dig up smaller submerged plants.